In November 2018, over 1,100 Christians from across the denominations and traditions gathered in Teesside. 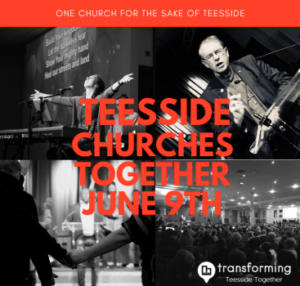 We worshiped together as one Church, we prayed together for the land that we are placed in, and we committed to the unity of Jesus’ Church here in Teesside. On Sunday 9 June 2019, at 6pm, we will be gathering again. This time our focus will be YOU ARE THE CHURCH, and we will be hearing from Christians who are scattered all across the Tees valley every single week, sharing inspiring stories of lives being transformed, disciples being made and Jesus’ kingdom advancing. We will also be celebrating the launch of Serve Teesside out biggest joint serving project ever. Tickets are limited to 1,000 people, so please don’t wait to book. It’s at The Oakwood Centre, Cleasby Way, Eaglescliffe TS16 0RD. Book your free tickets here.